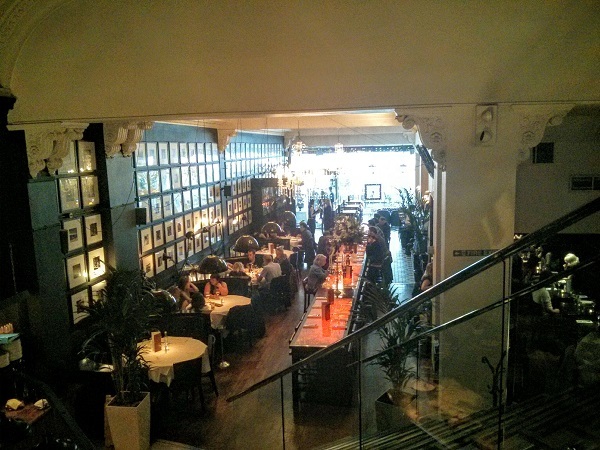 The first thing that struck me on entering Gusto was that the inside of the restaurant was much bigger than I had expected. The double height ceiling gives the main dining area a real feeling of space, and the decor is chic without being overly fussy. The Cheese Friend and I particularly appreciated the long, lit-up tables in the centre, which reminded both of us of the salt lamps sold at the Christmas market. 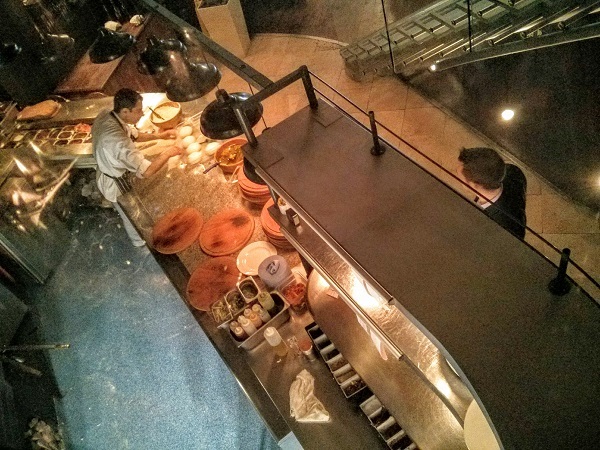 Our table was on the mezzanine level at the back, temptingly placed above the open kitchen so we were able to look down and spot our food coming onto the passe. The menu is fairly extensive, and we struggled a little bit to choose as it all sounded so appealing. I decided on a Redcurrant Mai Tai to aid the decision making process, before settling on the calamari (always a litmus test for a good Italian restaurant) and one of the specials: monkfish with fregola and pomegranate salad and a lobster sauce. My Cheese Friend opted for the frito misto to start, and the handmade artichoke tortellini. We also opted for a portion of garlic mushrooms and deep fried courgettes to share. 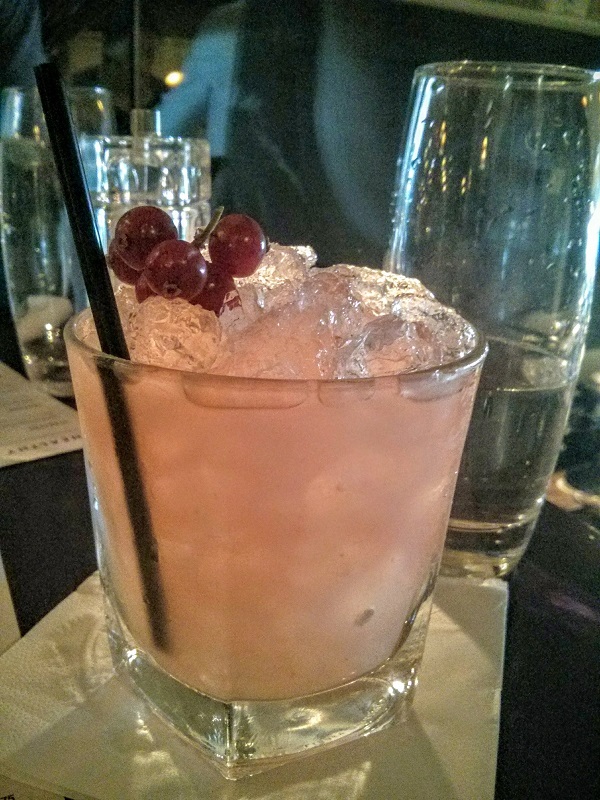 As I sipped at my delicious cocktail, the Cheese Friend and I were unable to resist peering over the balustrade of the mezzanine into the kitchen below. I observed my monkfish coming out to be seasoned before disappearing back into the kitchen to be cooked. We also had the opportunity to watch other people’s food being prepared and regret not being able to try some of the other options as well. With great anticipation, we observed our starters being set on the passe and inspected before making their way up to us. 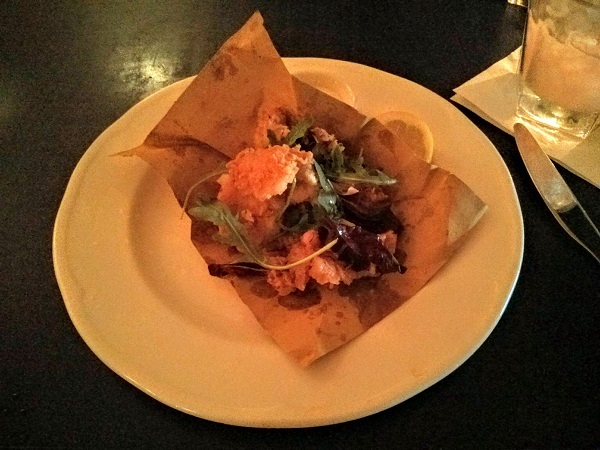 Both the calamari and the frito misto were pleasantly crisp, the batter not greasy at all. My calamari was perfectly cooked, soft rather than rubbery and served with mayonnaise and a squeeze of lemon, just as I like it. 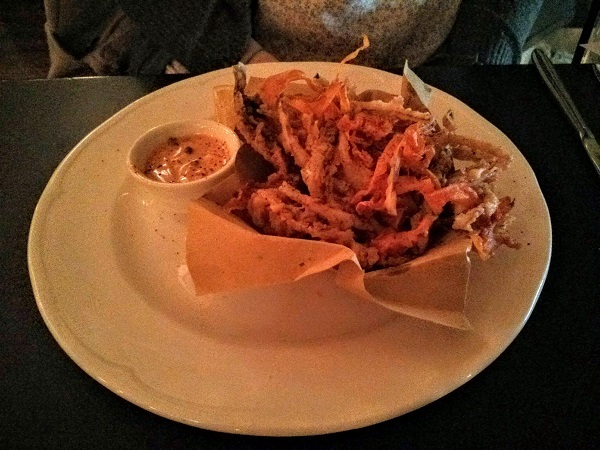 The Cheese Friend’s frito misto was likewise very enjoyable with a spiced tomato mayonnaise to give it kick. Our main courses arrived shortly afterwards, and we tucked in with gusto. The artichoke tortellini were beautiful, pasta perfectly thin and bursting with flavour from the rich artichoke puree within. The brown butter sauce was a great compliment and the dish was a hit which I would certainly recommend. My monkfish was also very tasty. 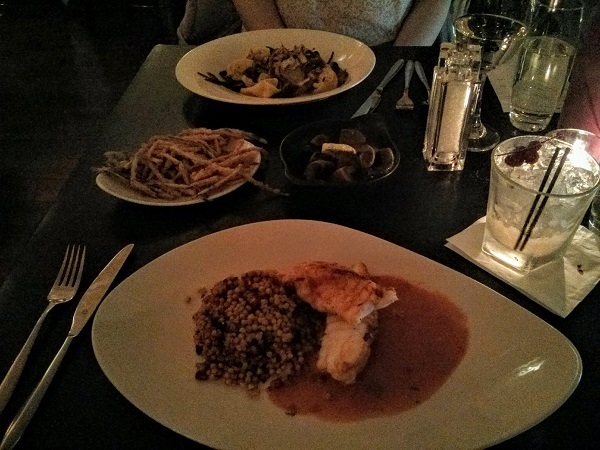 The fish itself was well cooked and moist, and the fregola salad was a refreshing match. The lobster sauce was velvety and enhanced the subtle flavour of the fish. What I was most interested by, however, was how well the pomegranate seeds in the salad and the sauce went together. I had initially been sceptical of the combination of lobster and pomegranate, but I very much enjoyed the combination of flavour and texture. The sides were good as well; crunchy battered courgette chips, soft in the middle and mushrooms fragrant with garlic. Although we were feeling fairly satisfied by this stage, we were unable to resist the lure of the dessert menu. I opted for the baked flaming alaska, having never actually tried a baked alaska but always wanted to, while my Cheese Friend opted for her favoured cannoli (the bar was set quite high for this as she is used to the offerings from the excellent Sicilian pastry shop in Leith). I had also been desperate for an excuse to try the Tiramisu Martini mentioned in the Signature Cocktails list, and felt this would be a perfect accompaniment to dessert. 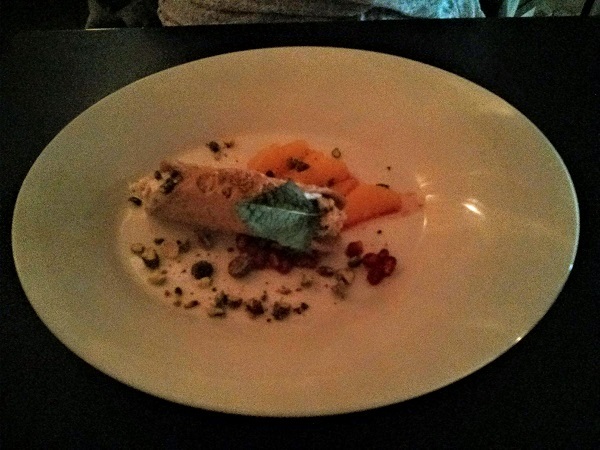 One thing I would like to note at this stage is that, although the food was excellent, we felt at times that the presentation let it down a little bit. As we were sat above the passe, we were able to observe the finishing touches being put on a number of dishes, including our own. We both felt that the final plating, particularly of sauces, was a touch careless at times. The only reason I would like to mention this is because both the Cheese Friend and I thought that the food deserved more care as the flavour and cooking were so good. 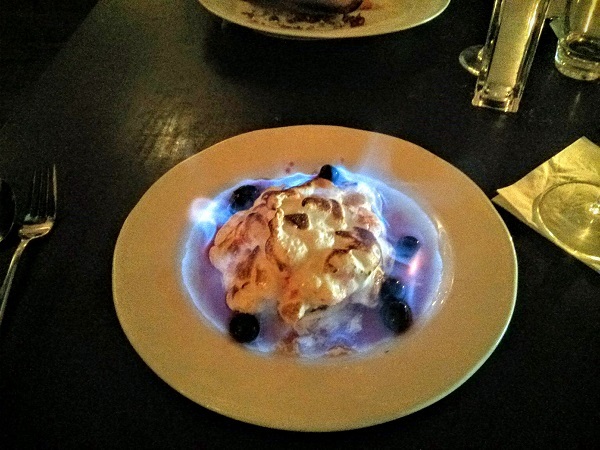 Our puddings arrived with some ceremony, and I was delighted with the theatricality of having the flaming cherry liqueur poured over my baked alaska at the table. The Cheese Friend’s cannoli was very pleasing as well; a crisp, sweet outer shell filled with fragrant vanilla mascarpone and toasted hazelnuts, with fresh fruit on the side. My baked alaska was slightly disappointing; the centre was over frozen and the meringue, which had been lightly caramelised with a blowtorch before it came to the table, ended up slightly burnt in places from the flaming liqueur. The flavour was nice, but it would have benefited from being taken out of the freezer slightly earlier, and caramelised slightly less before being flambeed. The Tiramisu Martini, however, was divine. My food is on fire! The Cheese Friend and I both left feeling very satisfied and thinking that we would gladly return to Gusto as a treat some time, especially as there were many other options on the menu that we wished we had room for. Last updated by Slaine at October 8, 2016 . No more over-powering sauce please! Aspiring food writer, consummate nerd and appreciator of all things food.